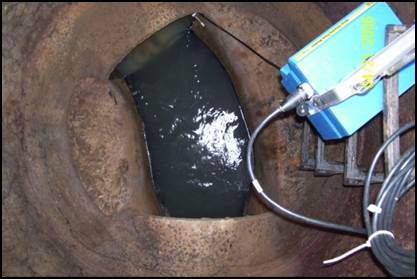 Flow Monitoring is a complex, high tech undertaking that forms part of a comprehensive sewer system evaluation survey (SSES). 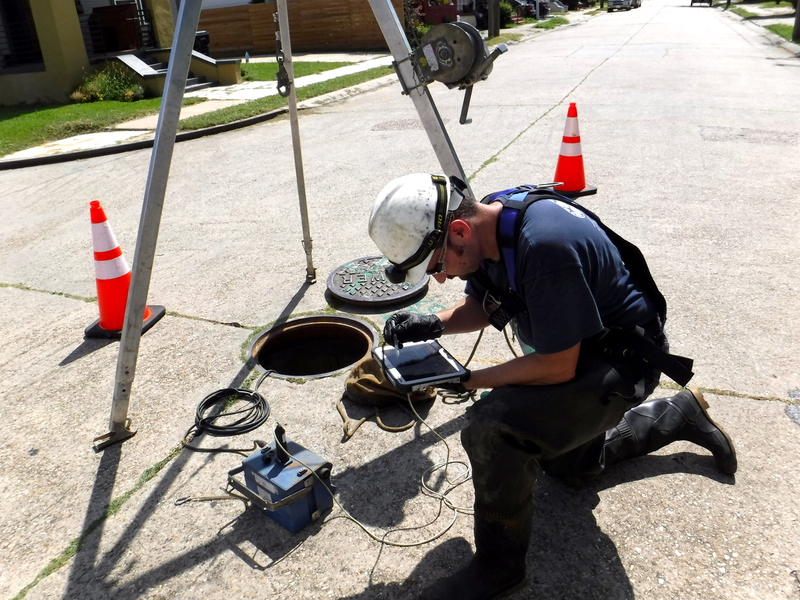 Typically the first step in a complete SSES project, flow monitoring is the process of analyzing the hydraulic characteristics of a sewer system. Flow monitoring supplies the data required to quantify inflow and infiltration (I & I) of sub-basins throughout the collection system. The data can then be used to prioritize future inspections to identify the I & I sources. It can also be used by engineers to provide hydraulic modeling, design and evaluate conveyance systems, pump stations, and treatment facilities. After installing flow meters within various basins or sub-basins, we collect information during dry days and wet weather days. Once the data is received, the average daily flow is compared to the wet weather reaction to rainfall events of different intensities and totals. By subtracting average flow from the wet weather flow response, we can measure how much I & I is getting into the system. 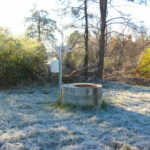 Rain gauges are installed to compare rainfall events to increases in flow quantities. Results are analyzed to determine I & I quantities. Overflow sites can be monitored to determine how much waste-water escapes during system overloads. 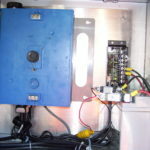 The information gathered by flow monitors and rain gauges can be used to develop new systems or analyze current systems. For example, we can divide large areas of a municipality into sub-basins. Collected data is analyzed, and then the sub-basins can be compared and prioritized by high groundwater infiltration and high rainfall dependent I & I. The worst areas can be scheduled for a variety of additional inspections to determine the sources of the problems. CES provides temporary flow studies, permanent flow networks, flow meter maintenance, and pump station calibration. 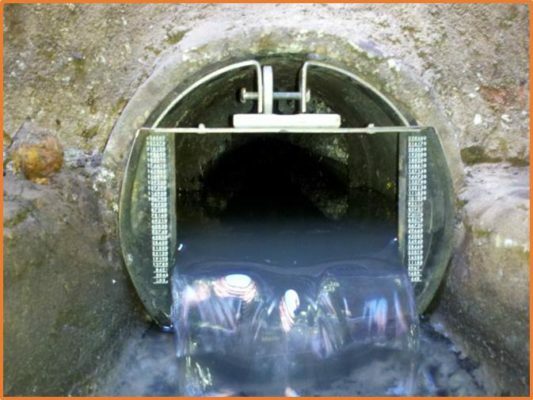 An essential tool used in sewer evaluations, night flow isolation, measures possible infiltration in sewer lines. This task aims to isolate sewer line segments and measure the suspected infiltration. 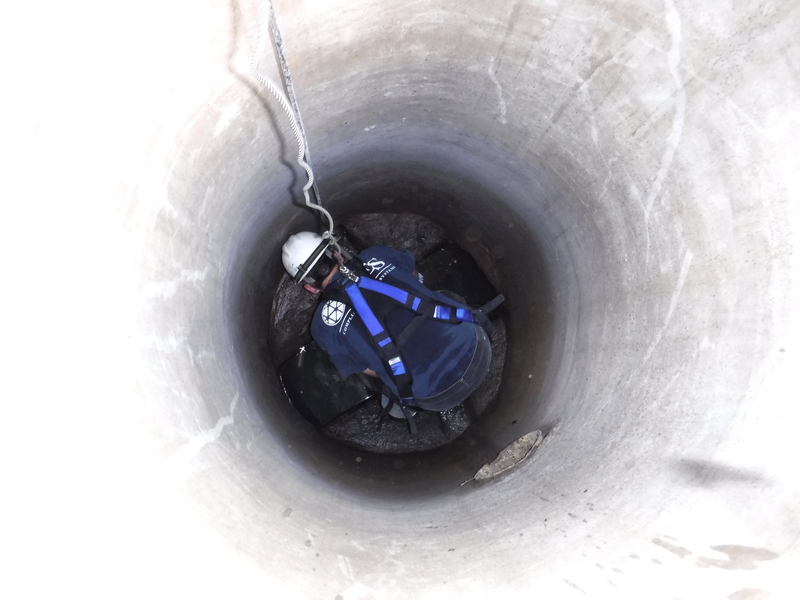 Our crew performs this task in the sewer system during early morning hours, between midnight and 5:00 a.m. Theoretically, the sewer flows should be virtually zero at this time. The test evaluates isolated sewer lines of approximately 1,000 linear feet. The line segments tested must have all upstream lines plugged or isolated with other tests. These isolated lines with significant flows during the early morning hours are most likely to have substantial infiltration. A volumetric calibrated weir is a portable flow-measuring device used to measure infiltration in newly installed and existing sewer lines. The volumetric weir is a compound weir that incorporates the advantage of a 90° V notch for measuring small infiltration flows where accuracy is imperative. It measures from 57 gallons per 24 hours to 3,700 gallons per 24 hours, which is the range of normal sewer line Acceptance Test Requirements. The rectangular section is capable of measuring in gallons per day up to 35% of pipe capacity. Volumetric weirs are able to measure flow in 6″, 8″, 10″, 12″, 14″, and 15″ pipe. Adaptors for 18″, 21″, 24″, 27″, 30″, 36″, 42″ and 48″ pipe are used in conjunction with a 15″ weir. The specification provided by the client performs all night flow isolation procedures. For information concerning our work or your project, please visit our contact page to find your regional contact or fill out a form, and we will be in touch as soon as possible.